Our #CapitolPathways internship program has crossed the halfway point! 34 college students of color are working with their individual host organizations for 10+ hours a week in a paid internship, which provides them access to legislators, lobbyists, and other professionals working in and around the Capitol during the legislative session. Over the course of the internship, we’ve asked a few student interns to answer a few questions about their experiences thus far. Today, we highlight Maddie Schumacher (pictured above: center; pronouns: they/them), a fourth-year American and Urban Studies major at Macalester College. 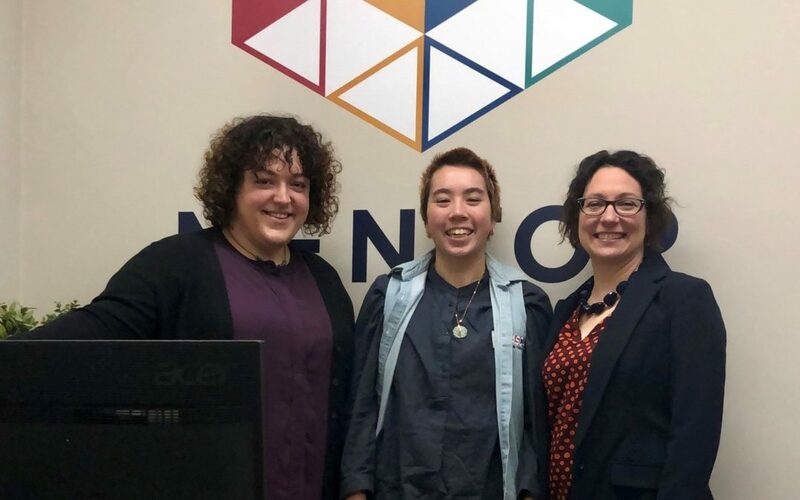 They are working as the legislative assistant for MENTORMN, an organization that supports mentoring relationships for youth throughout the state. Maddie’s experience includes work for Ujamaa PLACE, the Amherst H. Wilder Foundation, and the federal Office of Minority Health under the U.S. Department of Health and Human Services in Washington, D.C. This spring, they are excited to continue volunteering for the Women’s Prison Book Project and learn African Based Movement at school. Q: What did you hope to achieve by participating in Capitol Pathways? MS: I hoped to have a better understanding of the legislative process. As a person with a background in community organizing, I wanted experience on the other side of the table. Who actually has power over policy and funding? I had preconceived ideas about who ran the Capitol and the prevailing culture. I thought that the legislators that had power were all white men and, to a much smaller degree, white women. My experience as a Capitol Pathways intern has affirmed that assumption. Even as the people of Minnesota elect an increasingly diverse body of representatives, a legislative code of conduct and system of seniority preserves antiquated authority. Q: As a result of participating in Capitol Pathways, how do you see yourself being an active member of your community? MS: If we are dissatisfied with our representation, it is up to us to find someone better. As a result of this internship, I feel empowered as both a constituent and a future policy professional. I feel a great responsibility for my community, and that looks like holding our representatives accountable, building strong relationships with legislators, and rallying behind people who will fight for us. Stay connected to Capitol Pathways! Sign up to receive updates in your inbox. A gift of any amount is valuable and goes directly to support the program. Donate today to support students of color and their path to becoming civic leaders in Minnesota.